There are three options for travelling to Falmouth from London for an MEI Conference- air, road and rail - of which the latter has always been my preferred option, particularly during the summer when the roads are very busy (see also posting of 17th February 2009). 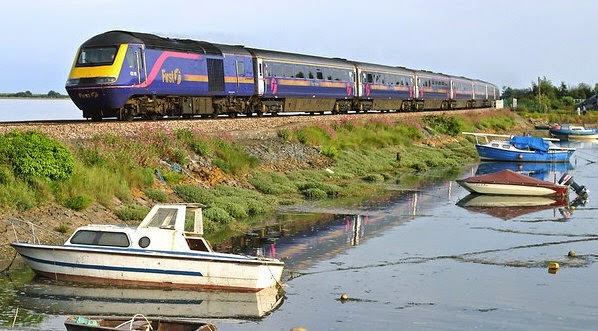 The Great Western Cornish Riviera Express from London's Paddington Station to Penzance is one of the world's great train journeys. If you are arriving in UK at Heathrow Airport, the journey to Paddington on the Heathrow Express is only 15 minutes, and from Gatwick take the Gatwick Express to Victoria Station, from where it is a short taxi or tube journey to Paddington. An alternative is to take the train from Gatwick to Reading, where you can connect with the Paddington-Truro train, but be aware that seat availability may be limited at this stage of the journey, so we advise that you book and reserve your seat in advance. Always a great experience, there are now two more good reasons to go by train. All carriages now have complimentary high-speed WiFi, and the Pullman Restaurant car has now been re-instated, where you can enjoy a superb freshly cooked meal between London and Plymouth, while dining in first class comfort. So our advice is to take the train, relax and enjoy the wonderful English countryside, have a great meal, and keep up to date with your emails. Alight at Truro, then take the train on the adjoining platform for the 20 minute journey to Falmouth, where you will be met by one of the MEI team, and transported to your hotel. We are looking forward to another great summer in Falmouth, with programmes for four high quality conferences now in place. In May Precious Metals '15 will run back to back with Nickel Processing '15. The programme for Precious Metals '15 can be found here, and here for Nickel Processing '15. In June Computational Modelling '15 will be followed by Physical Separation '15. Click here for the programme for Computational Modelling '15 and here for Physical Separation '15. As with all MEI Conferences in Falmouth, you will also get the opportunity of spending some time in Cornwall, one of the world's most beautiful areas, once the world's biggest producer of copper and tin. 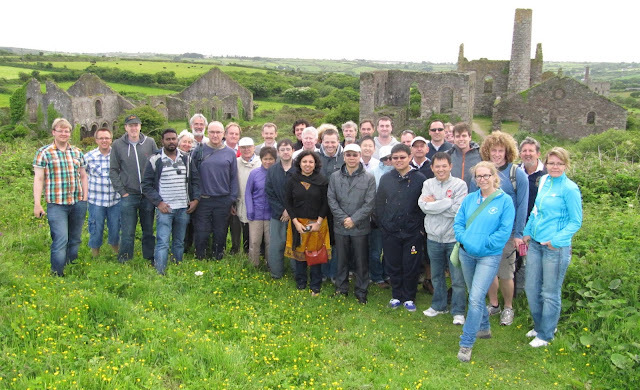 Physical Separation '15 delegates will have the added bonus of a visit to the Camborne-Redruth mining area, the "birthplace of modern mining". If you intend to be at any of these conferences, registration is now open, and we recommend that you book your accommodation as early as possible, as Falmouth, a popular holiday resort, is busy during the summer months. Finally, if you are interested in presenting papers, it is not too late to send me short abstracts. MEI's Flotation '15 consultant Jim Finch was at the Canadian Mineral Processors Annual Meeting in Ottawa earlier in the month, and tells me that there was a very good turnout despite low commodity prices. I have also received today, by email, this photo from Nan Amaratunga, wife of Lucky Amaratunga of Laurentian University. 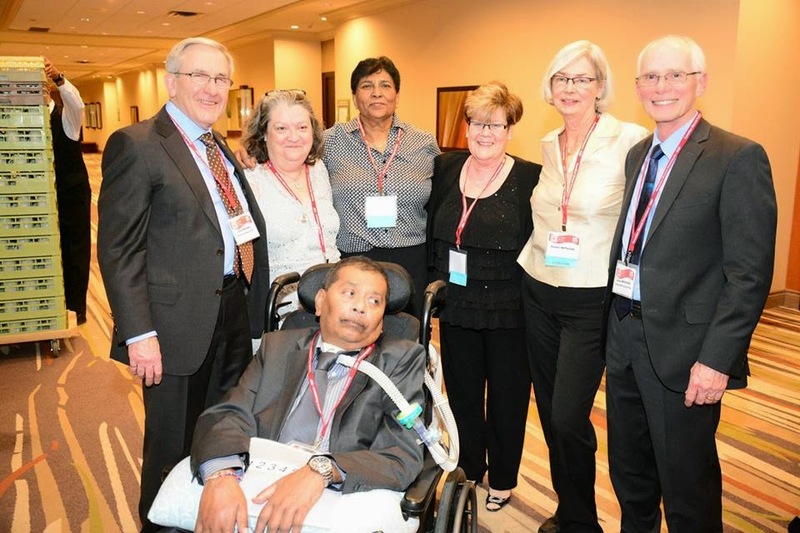 Pictured with Lucky are (left to right) John Starkey, Louise Madaire, Nan Amaratunga, Donna Starkey, Susan McTavish and Stewart McTavish. If any of you were at CMP and would like to share your photos, or views on the conference, I would be very pleased to hear from you. One of the messages that came out of Process Mineralogy '14 is that we can now characterise mineral assemblies in what can be a bewildering number of ways, such that the challenge now is to apply this data on mine sites in a language that operators can understand. Automated mineralogy is a sophisticated tool which can reap great benefits to mineral processors, so the principles must be incorporated into undergraduate courses, to train mineral processors in its use and its great benefits. It is a rapidly evolving field and we expect more innovations to be announced and discussed at the next meeting, Process Mineralogy '17, which will be held in Cape Town in March 2017. Already we have major corporate support from ZEISS and Bruker so the early signs are that this will be a major event, as were the previous conferences in Cape Town. A change of venue last night for the Cornwall Mining Sundowner. Falmouth's Chain Locker was forsaken for the first time, with the aim of moving the sundowner around the major Cornish towns. 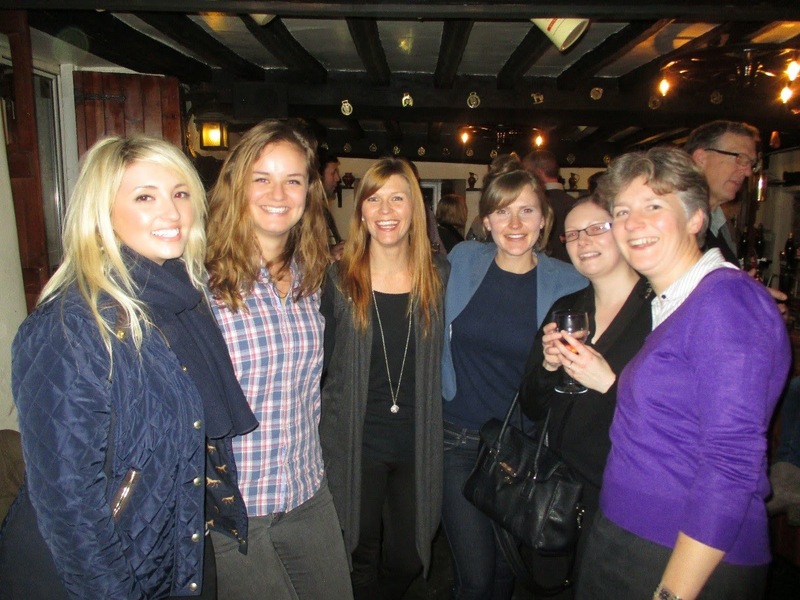 Last night's event, attended by 16 people, was held at the County Arms in Truro. Among the few mineral processors were Nick Wilshaw and Kathryn Hadler, of nearby Grinding Solutions Ltd. 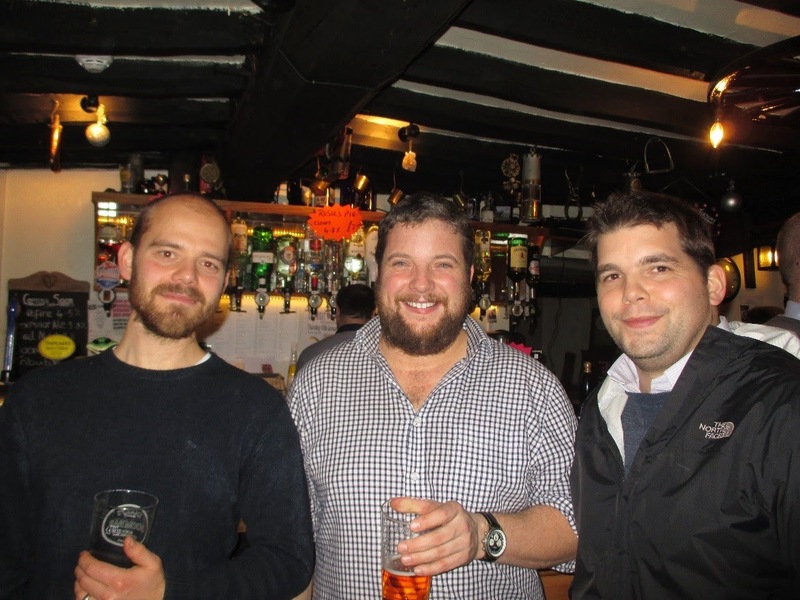 Earlier in the month, on January 9th, a record turnout of 30 mining and related personnel attended the latest Devon Mining Sundowner at the Miners’ Arms, Hemerdon Village. 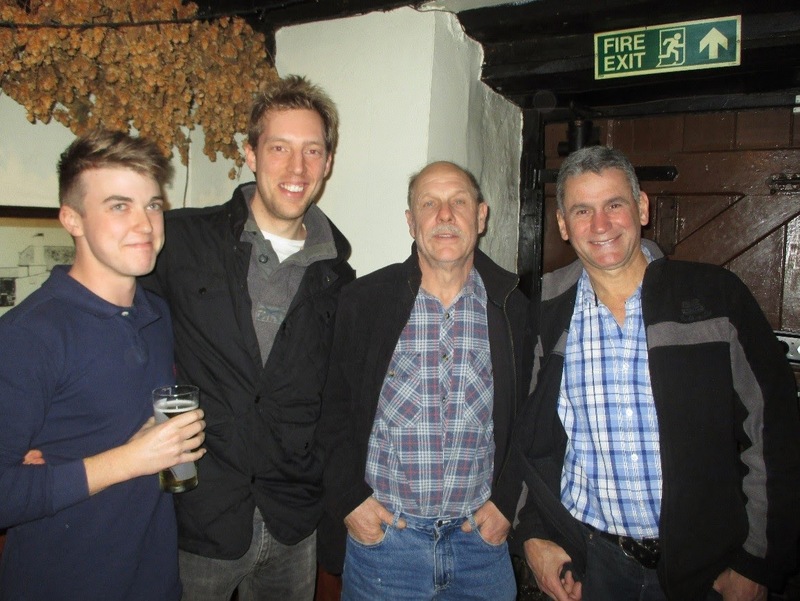 Those attending included Wolf Minerals personnel from the Drakelands operation, from the Plymouth Science Park office and from Perth head office; special guests included Roger Craddock, the former AMAX Hemerdon project manager and Robin Boon former Geevor and South Crofty chief surveyor. Iceland has long been on top of my list of places to visit, as its geology is unique and of great interest. The island lies on the divergent boundary between the Eurasian plate and the North American plate. It also lies above a hotspot, the Iceland plume, which is believed to have caused the formation of Iceland itself, the island first appearing over the ocean surface about 16 to 18 million years ago. The result is an island characterised by repeated volcanism and geothermal phenomena such as geysers. 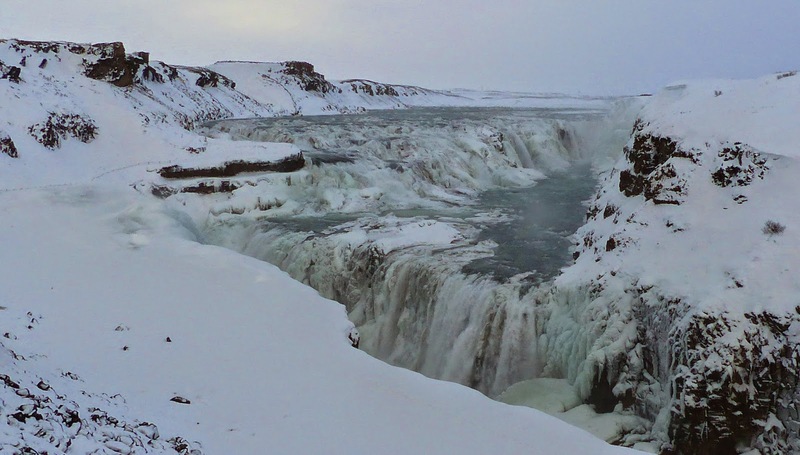 Many of the delegates who attended Comminution '10 will not forget that in 2010, a volcano in Eyjafjallajökull in the south of Iceland erupted for the first time since 1821. The eruptions on 14 April forced hundreds of people to abandon their homes and the resultant cloud of volcanic ash brought major disruption to air travel across Europe, leaving Amanda, Jon and European delegates stranded for a week in Cape Town. Barbara and I have just returned from our first visit to Iceland, spending 2 nights in the capital, Reykjavík, and two nights close to the Hekla volcano in the south of the island. We explored the south of the island and the 'Golden Circle' in the south-west, returning to the airport via the very touristy Blue Lagoon, a man-made lagoon fed by the waste-water from a nearby geothermal energy power station, one of many such plants that provide Iceland with around 65% of its energy, contributing to the 99% of the island's primary energy from renewables. As to the aurora borealis - well we did catch a tantalising glimpse in Reykjavik at one o'clock in the morning, a faint green smudge on the distant horizon, but nothing after that. The northern lights would, however, have been the icing on the cake of a fascinating visit to this unique island. Below are a few photos which might wet your appetite for a similar short visit such as ours, which was hosted by the excellent Voyages Jules Verne and our tireless and knowledgeable guide Holmfridur. There is a lot of bad science around, which is reflected in Minerals Engineering's current rejection rate of 67% (posting of 26 November). A recent report by the Nuffield Council on Bioethics showed evidence of scientists increasingly “employing less rigorous research methods” in response to funding pressures. A 2009 survey found almost 2% of scientists admitting that they have fabricated results; 14% say that their colleagues have done so. The last statement is particularly worrying, but of the 67% of papers rejected by Minerals Engineering a very high proportion is due to lack of scientific rigour in the design of experiments and the interpretation of results. There appears to be a significant lack of understanding among many workers of how to apply statistical approaches to research, but thankfully I have a number of very experienced and respected researchers who I can turn to for advice in this area. One of them is Prof. Tim Napier-Munn, who has recently delivered the 135th of his statistics course which he presents around the world. He is passionate about our profession utilising statistics properly and has now had a book published, based on his professional development courses, which should be on the bookshelf of every researcher in our industry. 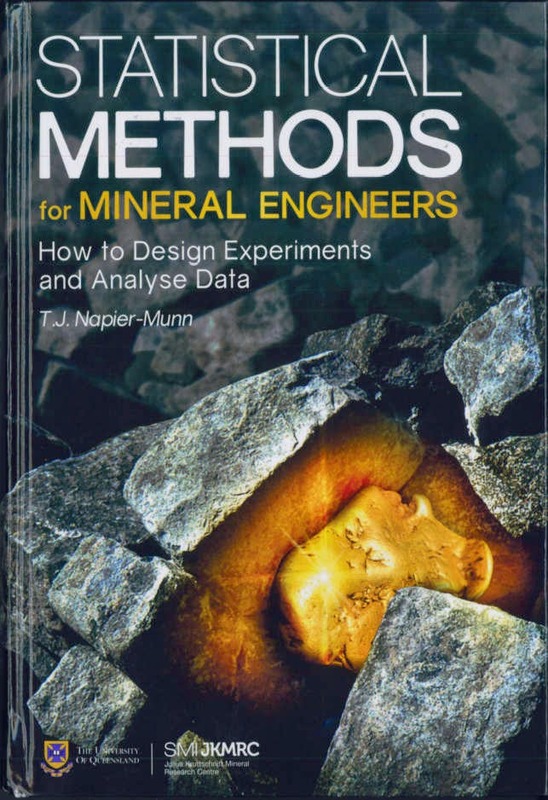 Written by a mineral engineers for mineral engineers, Statistical Methods for Mineral Engineers (How to Design Experiments and Analyse Data) is packed with real world examples, and de-mystifies the statistics that most of us learned at university and then forgot. It shows how simple statistical methods, most of them available in Excel, can be used to make good decisions in the face of experimental uncertainty. Written in accessible language, it explains how experimental uncertainty arises from the normal measurement errors and how statistics provides a powerful methodology to manage that uncertainty. It assumes only that the readers are numerate, can use Excel, and want to do a better professional job. It is aimed squarely at mineral engineers and allied professionals (such as chemists) on the mine site, in head office, in engineering and supply companies and in universities. • the presentation of data – charts, tables and PowerPoint. • uncertainty in data – precision, accuracy, the normal distribution, sources of error. • comparing quantities using hypothesis tests such as the t-test, F-test, chi-square test, ANOVA, non-parametric tests. • modelling using regression analysis, including linear, non-linear and weighted regression. • designing and analysing efficient experiments and plant trials. • time series analysis, including variograms and time series models. • multivariate analysis (PCA, clustering, binary logistic regression, MANOVA). • performance monitoring and optimisation, including statistical process control and EVOP. • statistics for chemists and mineralogists, mass balancing, sampling (Gy theory). • Monte Carlo and bootstrap methods. • a selection scheme to choose the appropriate statistical tool for the job in hand. The book is available from the JKMRC website. The search to improve comminution efficiency will undoubtedly include some novel new technologies. But significant benefits are also likely from evolving existing technologies, new ways of operating, and combining the old with the new. Could advances in drilling, blasting, crushing, HPGRs and stirred milling relegate the SAG mill to a curiosity during our careers? These questions will be asked by Joe Pease of Mineralurgy Pty Ltd, Australia, in his keynote lecture at Comminution '16. Joe has spent 21 years in operations in a variety of research, project and production management roles. He was manager of the Mount Isa lead zinc and copper concentrator for 8 years, and lead smelter manager for 2 years. He also spent 18 months with Cominco as Operating Superintendent at the Sullivan Mine, and Technical Superintendent at the Red Dog lead zinc operation in Alaska. He was Chief Executive of Xstrata Technology for 12 years, where his group developed and marketed technologies to improve the efficiency of minerals processing, smelting, refining and leaching. Joe is on the Board and Executive Committee of AMIRA, and is on the Advisory Board of the Julius Kruttschnitt Mineral Research Centre, and the Ian Wark Institute Advisory Board. He is a member of the Steering Committee of the Australian Minerals Education Partnership and assists with the student’s final year design project. He is Chairman of the Coalition for Eco-Efficient Comminution, the conference's Industry Advocate. 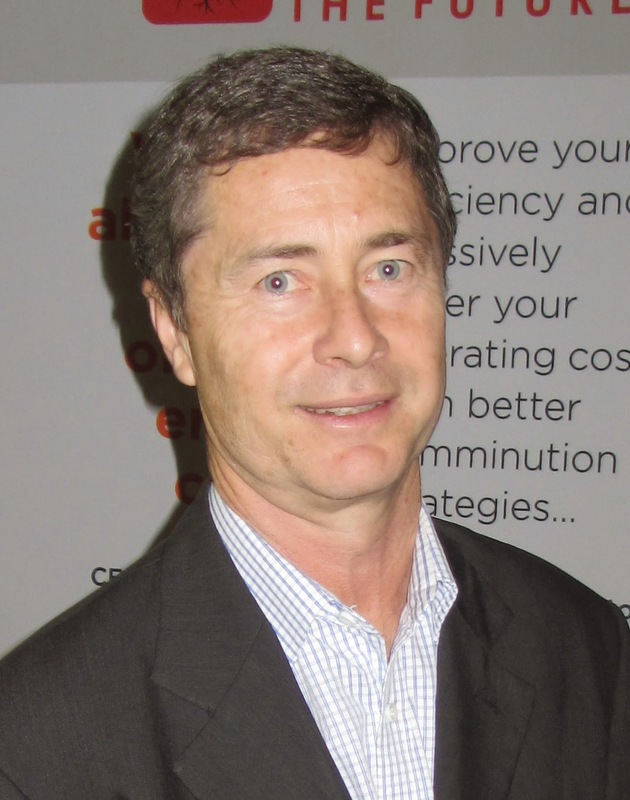 He is an independent Minerals and Technology consultant, associated with the small technical group Mineralurgy Pty Ltd. His passion is to identify opportunities between the traditional “silos” in processing – to combine different technologies to improve processing efficiency from mine to metal. With his extensive operating experience, his keynote will be a perfect prelude to Innovations in Plant Operations, a new concept where operators will be invited to submit short presentations describing how innovative techniques have benefited their circuits. Is the end of the world of mineral processing nigh? An article in the December issue of Materials World may have passed many people by, but it discussed a topic which would be of profound significance to the world, and, closer to home, to the minerals industry. Eoin Redahan asked "How close are we to a nuclear fusion reactor? ", a carbon-free process that produces four times more power than nuclear fission, with no waste disposal problems, and a fuel, isotopes of hydrogen, which is abundant. Despite billions of dollars having been thrown at it, fusion’s imposing challenge has not yet been met. For atoms to fuse, a huge amount of energy must be generated. As such, materials must be developed that can withstand hundred of millions of degrees. To create fusion energy, light atomic nuclei are fused within high-pressure, high-temperature plasma, which is contained by a magnetic field. As yet, scientists haven’t refined this magnetic confinement efficiently enough to reach a break-even point – where the energy output equals the energy input. As discussed in the article, billions of euros have already been spent on just one facility, the International Thermonuclear Experimental Reactor (ITER) in the south of France. The aim of the ITER project, which is funded by the EU, India, Japan, China, Russia, South Korea and the USA, is to prove that nuclear fusion is commercially viable. However, the goal of having its deuterium-tritium facility operational by 2027 is looking increasingly optimistic, but encouraging noises are being made about several smaller projects. According to researchers at Sandia Laboratories in Albuquerque, USA, their huge electric pulse generator is progressing in its pursuit of the fusion dream. In September 2014, the team reported significant by-products of fusion reactions in one of its experiments. Sandia’s approach involves putting fusion fuel inside a tiny metal can and passing a pulse of 19 million amps through it from top to bottom for 100 nanoseconds. The powerful magnetic field created crushes the can inwards at a speed of 70km/second. At the same time, the researchers pre-heat the deuterium fuel with a laser pulse and apply a steady magnetic field, which holds the fusion fuel in place. The team reports that it has produced significantly more fusion neutrons than previous methods, though there is still a long way to go – 100 times more neutrons will have to be produced to achieve break-even point. Lockheed Martin is a major American global aerospace, defence, security and advanced technology company, which caused a stir recently with claims that its compact fusion reactor, which will fit "on the back of a truck" and produce a 100 MW output, enough to power a town of 80, 000 people, will be developed and deployed within 10 years. The company claims that the key to the success of its reactor concept lies in a magnetic bottle that withstands 150 million-degree temperatures while offering 90% size reduction over previous concepts. 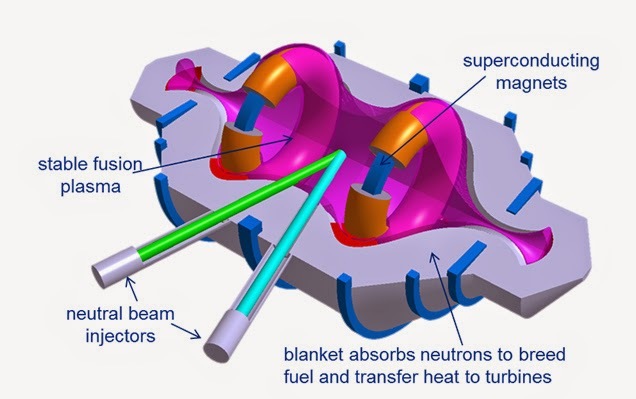 Lockheed Martin's plan is to "build and test a compact fusion reactor in less than a year with a prototype to follow within five years, operational reactors being available in 10 years time. There is obviously a lot of skeptism about these claims, but there is little doubt that the intent is there, and it could be a fair bet that sometime this century nuclear fusion will become a reality, If it does it will change civilisation as we know it, and will certainly have a profound effect on our industry. Ironically in the same issue of Materials World I authored a short article where I put a case (as I have done many times before) for froth flotation being the most important technological development since the discovery of smelting. But what would be the future for flotation if nuclear fusion became a practical proposition? Would its use be confined just to the production of industrial minerals? Would there be any need to comminute and concentrate metallic ores, and concentrate them prior to smelting? Maybe the metal mines of the future might crush the mined ores to make them easier to handle, and then transport them to huge on-site or custom smelters where the ore would be direct smelted, the energy being supplied by the smelter's on-site fusion reactor? The advantages of pyrometallurgy are of course that reactions are much faster at high temperatures than they are in slurries or aqueous solutions, and mineral characteristics are lost in melts, making the reactions controllable by known universal thermodynamic and kinetic laws. Separation by differential melt solubility or volatilisation permits recoveries that are impossible by mineral processing methods. It would be a strange new world, little comminution, no concentration, no need for process mineralogy and expensive automated scanning electron microscopes, and more seriously no further editions of Wills' Mineral Processing Technology! And probably quite a dreary one- what would be the technological challenges once complex ores are no longer complex and when we are all pyrometallurgists? So what do you think? Is this likely to happen in this century? My bet is that it will, although within 10 years might be optimistic. Never underestimate the ingenuity of man; if great minds get together to solve a problem there is a fair chance that they know that the problem can eventually be solved. There are great parallels with the Large Hadron Collider at CERN. Particle physicists have their various theories of the origin of matter, much of it hinging on the quest for the Higgs boson, but to find proof protons must be collided at near light speeds to basically see what happens. The science behind the LHC experiment is therefore fairly simple, but the engineering problems are immense, but were overcome despite much opposition. Questions were asked about the possible benefits to humanity, and I like the answer of one of the project leaders who said that when radio waves were discovered they were not called radio waves, as there were no radios! Similarly the science behind nuclear fusion is simple- smashing hydrogen atoms together to produce helium and lots of energy. The engineering problems are, however, truly formidable, but the fact that billions of dollars are being spent on the quest for controlled nuclear fusion suggests that these might eventually be overcome. I have received a short report on last year's IMPC in Santiago, from Przemyslaw Kowalczuk of Wroclaw University of Technology, Poland. The authors of the report are shown below at the IMPC. Poland was represented by a strong delegation, as an important event was the bid for organizing the IMPC in 2020. There were 5 candidate countries (France, Germany, Poland, South Africa, USA). The Polish presentation was very well received. The short list now contains Poland, South Africa, and USA. The list will be further narrowed during the next Congress, which will be held in Quebec City, in Canada, in 2016. The paper by M. Powell, B. Foggiatto and M.Hilden (Practical simulation of FlexCircuit processing options, IMPC 2014) presented the idea of flexible mineral processing circuits. This theme seems to be the most important destination of mineral processing. The idea of flexible mineral processing, according to the authors, was introduced by Powell and Bye in 2009. Mineral processing plants, which will be using the flexible processing approach, will reduce the cost of processing, improve upgrading outcome and increase control of process by fast responce to changes in ore properties. The flexible processing of materials is based on several essential elements discussed by the participants of the Congress. The most important seems to be advances in automated process control. It will lead to reduction of process variability, allowing maintainance of high throughput and keeping the process within certain constraints. The flexible processing approach will be possible by proper sampling, on-line process mineralogy, and using proper process models based on simulation and optimization. According to F. Pitard (Correct sampling system and statistical tool for metallurgical process, IMPC 2014) proper sampling is an important element of flexible processing. Presently, bad sampling practices plague the scientific community and industry. It is responsible for money loses and unsatisfactory science. Equally important is on-line characterization of material using automated mineralogy. According to papers presented at the Congress, automated mineralogy can be based, depending on processed material, on analysis provided by QEMSCAN, MLA, XPS Rietveld XRD, Laser Induced Fluorescence, Raman Spectroscopy, Synchrotron X-ray Microprobe and other techniques. These techniques seem to be in an early stage of development in application to mineral processing since, according to many Congress papers, there are numerous problems associated with distinction between certain minerals (for instance between tennantite and enargite), difficulties to see surface films, surface contaminations, amorphous phases, carbonaceous matter, very fine and highly disseminated particles, as well as recognizing differences in degree of crystallinity, complex solid solutions and mineral series. Also important is proper simulation of properties based on the texture and properties of ores and particle liberation and simulation of the whole process to keep the flexible circuits running under optimal conductions. The most discussed topic was flotation and related issues. The importance of efficiency of comminution, water management, environmental aspects and role of hydrometallurgy in supplementing flotation methods of upgrading, which were also discussed during the Congress, is worth mentioning. Professor Roe-Hoan Yoon from USA received the Lifetime Achievement Award (Prof. Janusz Laskowski obtained this award in 2008) while Dr. Barry Wills was the recipient of the award for Distinguished Service to the mineral processing community. There were 10 awards for young scientists. One of the organizers of the IMPC 2014 was the University of Chile, Department of Mining Engineering. 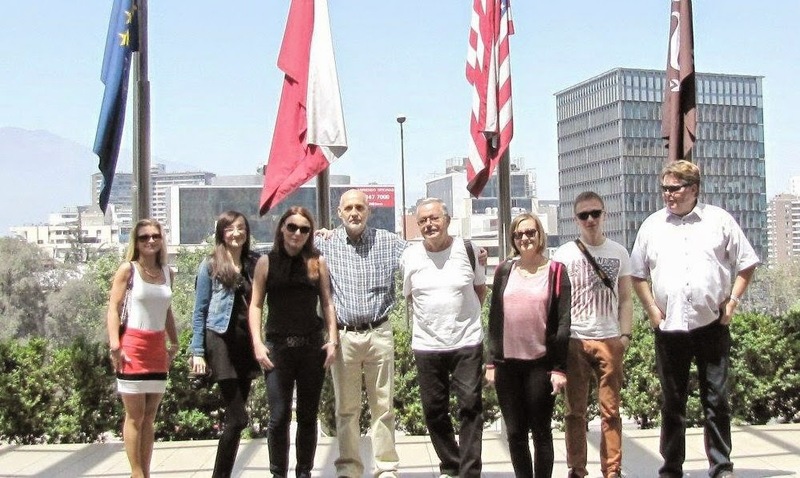 The Polish delegation spent one day (October 24, 2014) visiting the University. Our host was Prof. Willy Kracht. We discussed current issues of mineral processing and possible cooperation between our Universities. We also visited the area of Valparaiso, the location of another Congress organizer, University of Tecnica Federico Santa Maria, Department of Chemical Engineering and Environmental Engineering. The chairman of IMPC was Prof. Juan Yianatos from that University. We have collected heavy minerals and beach sand samples from the Pacific Ocean area in the Valparaiso region. IMPC 2014 was a great and fruitful event. I would like to thank Przemislaw for providing this report on the IMPC through Polish eyes, and I wish Poland every success in the bid to host the 2020 IMPC. The last IMPC to be held in Poland was in 1979, in Warsaw under the chairmanship of Prof. Janusz Laskowski, and the time is ripe for a return to that beautiful and friendly country. Now that the wheels are slowly beginning to turn again, could I remind everyone that if you would like to nominate a young person for MEI's 2014 award, the deadline for nominations is only a month away. Full details can be found on the posting of 15th September. Last year was not a great year for the minerals industry, with all the major metal prices suffering to some degree, platinum in particular. But we always look forward with optimism, knowing from past experiences that the fortunes of the industry are cyclic. No matter what the state of the industry, however, there will always be a need for people to come together to discuss common problems and seek innovations, and there are some fine conferences on the horizon. The full list of MEI Conferences for 2015 through to early 2017 is now available. Nickel and precious metals have suffered recently, so May will be an opportune time to visit beautiful Cornwall, to discuss common problems and the ways forward at Precious Metals '15 and Nickel Processing '15, which will run back to back in Falmouth. The provisional programmes for both these events have been published but we still invite abstracts if you would like to present papers. 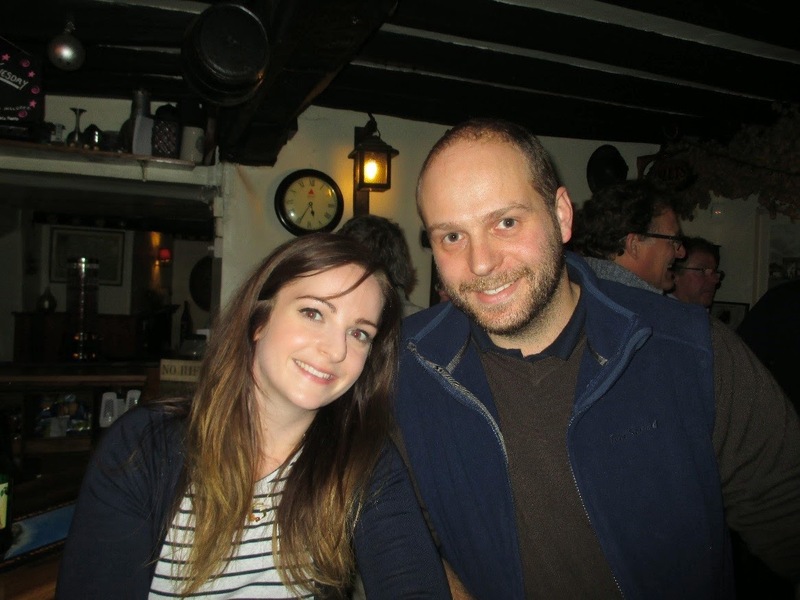 Later this month we will be putting the provisional programmes together for Computational Modelling '15 and Physical Separation '15, which will also take place in Falmouth, in June. So we invite your abstracts for these as soon as possible. Our main event this year will be Flotation '15 in Cape Town in November. We already have a record number of sponsors for this, so it looks like being a big one. We invite your abstracts by the end of May. MEI is a media partner for a number of other major events in 2015 and we plan to get to as many of these as possible, and look forward to an active year, catching up with old friends and meeting new ones. So we wish you all a very happy and prosperous 2015.